When Clark Kent lived in Smallville and operated as Superboy, Prof. Dalton created a Duplicator Ray Machine. The device - activated, produced a duplicate of Superboy himself...albeit an imperfect duplicate. Known as Bizarro, the creator was a reverse-thinking, squared-off humanoid. His friendly intentions were overshadowed by his destructive actions. Eventually, Bizarro destroyed himself, when he realized he could not fit in society. Years later, Lex Luthor recreated the Duplicator Ray Machine, and duped Superman into its range. A new Bizarro was created, this one more powerful and deadly, as he was an imperfect double of the fullgrown Man of Steel. A true monster, Bizarro was a real menace to Metropolis. Nevertheless, Superman created Bizarroworld - a cubic, imperfect duplicate of Earth itself; and created other Bizarros by having friends such as Lois Lane, Jimmy Olsen, and the Justice League of America duplicated with the imperfect Duplicator. Populating a planet in a galaxy far away, it was hoped that Bizarro #1 would live in peace. However, that was not to be, as he would - from time to time - return to Earth just for the sake of it. And every so often, a super-villain would get the idea of using Bizarro as a pawn in order to battle Superman. The Toyman and Lex Luthor are among the guilty to that! Bizarro even joined The Secret Society of Super-Villains. Although an imperfect, backwards-thinking construct, Bizarro is one of the most powerful beings in the cosmos. He rivals Superman's own powers and abilities. However, his lack of inherent logic and common sense allows him to be prey for the most manipulative menaces. And a benevolent person, who comes into proximity of Bizarro, may stand a chance if he or she expresses genuine friendship. 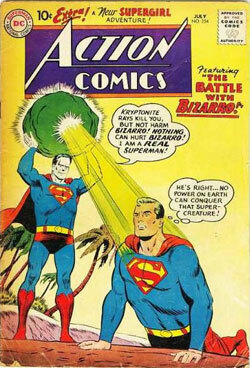 Bizarro's major weakness is Blue Kryptonite, a copy of Green Kryptonite via the Duplicator Ray. This Blue Kryptonite will affect true Kryptonians like Superman and Supergirl, but it is deadly to Bizarros.